Is it too early to start talking about snow? With temperatures in Chicago still hovering around 80s, snow may not be on your mind just yet. But then again, if you’re a Chicagoan like us, you know that winter always catches you of guard. While the actual first snow may still surprise you, there’s no need to be unprepared. As your Chicagoland roofers we feel obligated to give you a heads up. In case we get a snowy winter, snow accumulation on your roof is a dangerous thing. Also, the snow itself is bad enough, but if you add rain and ice into the mix, you end up with a serious problem literally hanging over your head. Needless to say, when it comes to snow removal in Oak Brook, Hinsdale, Downers Grove, Burr Ridge, Willowbrook or anywhere in Chicago’s Western Suburbs, you can always count of ATJ’s Home Improvement. If you’re part of homeowners’ association or run a property management company, this may be a great decision. If it’s just you and you home, then you (understandably) may want to stick to DIY approach. In 2016, there are a lot of cool toys when it comes to clearing snow from your roof. Long gone are days of traditional snow rakes. Don’t get us wrong, they’re not completely useless and it’s always a good idea to have one handy, but most of them are effective only when you’re on the roof or at least on the ladder and this, depending on the weather and your home, can range from unpleasant, to dangerous, to deadly. Just like most of you would prefer a good vacuum cleaner over a broom, there are way more efficient tools out there than a good ol’ snow rake. Below are a few things that every homeowner should have before the first snow. 1. A modern snow rake for your roof. Amazon sells a variety of them and you can check them out here. Our favorite is by far the Avalanche Snow Removal solution. It’s brilliantly simple albeit somewhat overpriced, but it works great. Most importantly, it’s designed to be operated from the ground, so to certain extent you’re paying not for the complexity of the tool, but for the invention and your safety. Alternatively, if you’re a handy type, you can construct your very own snow rake. Check out some tips here and here; they’re actually pretty genius. 2. 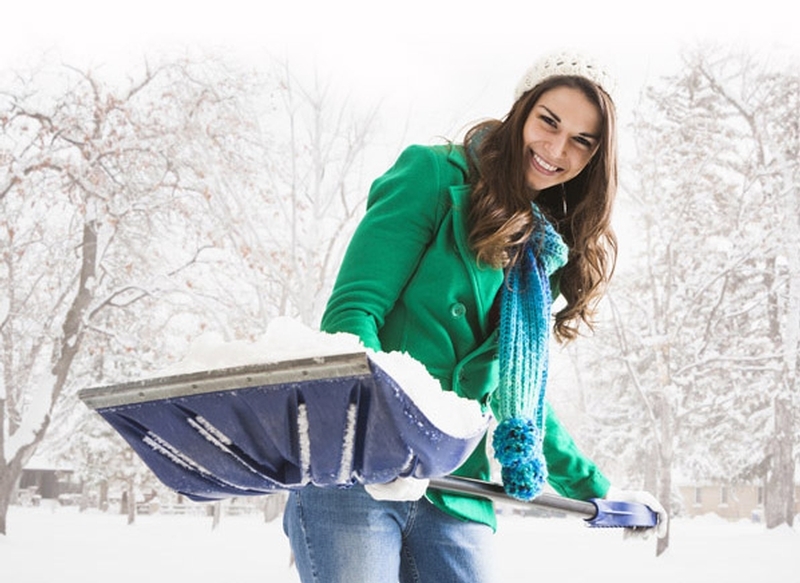 A dependable snow shovel, such as Aluminum Combo Snow Shovel w/Ergo Handle. The sides of the 20-inch-wide aluminum scoop rise up about 3 inches, so it carries 30 percent more snow than a traditional, flat-blade poly shovel. A steel wear strip busts ice and provides durability when scraped along pavement as a snow pusher. The aluminum shaft is arched to reduce back strain. 3. Snow melting granules, like Bare Ground. Don’t have time to shovel? Throw out these tiny green granules, which include pumice and are infused with magnesium chloride. Once wet, they leach out ice-melters, leaving a textured, walkable surface. There are more similar products on Amazon that you can check out and compare. So be smart, do your research now and order your winter gear online.